There are all kinds of records that a genealogist collects in hopes of forming a picture of a family member. The easiest to find are census records. These types of records provide us with a ton of information. The US Census changed the format and types of questions they asked over the decades. So, with each census you will get different information. In addition to census records, we can get cemetery records, photos of headstones, court records, military records, and vital records to name a few. One of the records I have recently found was that of a passport for my Grand-Uncle, George Stevens Whitehead. George Stevens Whitehead was my Grandfather’s brother. He was also a Rhodes Scholar. 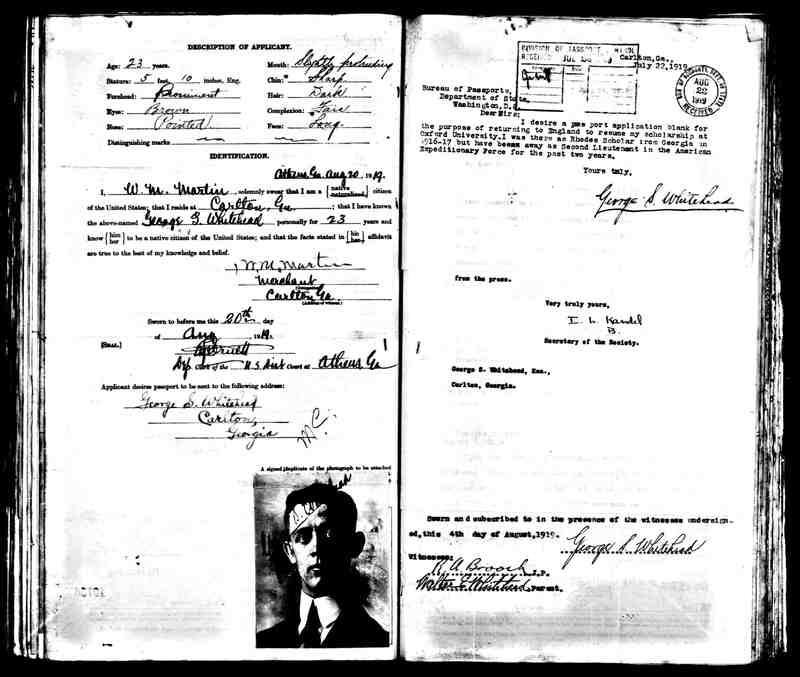 His passport application shows that he planned to board the New Amsterdam out of New York Harbor on 3rd October 1916. He was only 20 years old. I can only imagine the emotions he had prior to leaving on that ship. Presumably he graduated and returned to the United States. In 1920, George shows up in the US Census, living back at home. He is listed as not working. By the 1930 Census, he is listed as a Lawyer working in San Mateo, California. He is listed as a lodger. He is listed as a Veteran of WWI. In 1940, he is also listed as a Lawyer working in San Mateo, California. At this time he is 44 years old. He is also listed as single. George Stevens Whitehead died 24 January 1946 in Bay Pines, Pinellas, Florida. He was only 49 years old. Below is his obituary from the Danielsville Monitor, but you can’t believe everything you read in the paper. They put that Joe Whitehead was of Chicago. Fred Whitehead was from Chicago. Joe, Walter Joe Whitehead, lived in Carlton, Georgia. Danielsville Monitor, 1 February 1946 SERVICES HELD LAST FRIDAY FOR GEORGE S. WHITEHEAD George Stevens Whitehead, 50, former resident of Carlton, died last Thursday at the Veterans Facility in Bay Pines, Florida. Services were conducted from the Carlton Baptist Church last Sunday afternoon at 2:00 o’clock. Mr. Whitehead is survived by his father, Walter E. Whitehead; two brothers, Joe Whitehead, Chicago, IL; sister, Miss Martha Whitehead, Carlton; five nieces and nephews. He was born January 26, 1896 and attended Gordon Institute in Barnesville before entering the University of Georgia in 1912, where he was such a brilliant student it is doubtful if his scholastic achievements have ever been equaled. He completed the Bachelor of Arts degree course in three years and graduated in 1915. The next year he completed work for, and received his Master of Arts degree. While at the University he was a leader, not only in scholastic attainments but also in various campus and student activities, being especially outstanding in public speaking. He was one of the most popular students in his class. Mr. Whitehead was a member of Phi Beta Kappa national honorary scholastic fraternity, and went to England as a Rhodes Scholar, studying at Balliol College, Oxford University. He also held a teachers diploma from the University of California and an LLB from LaSalle Extension University. During 1917 – 1919 he served in the armed forces of the nation in the First World War with distinction as a Second Lieutenant. Later he was an Associate in the Department of Public Speaking at the University of California and in 1927 took up the practice of law in Burlingame California, where he resided at the time he became ill. I found that online. It is truly amazing the records one can find. Until next time, I will continue to explore backwards!